Only film directed by Yukio Mishima is a 30 minute story about honor and death. Based upon one of his short stories Patriotism tells the story of a Captain involved in the 1936 coup against the Japanese government who is ordered to kill all of the conspirators. The Captain though involved in the planing did not take part out of deference to his wife. The conspirators never betrayed his part in in the plan. Unable to turn his back on his loyal friends he chooses to commit suicide as does his wife. Brief graphic tone poem that was filmed on a Noh stage, it is felt by many as one of the numerous dress rehearsals for Mishima's own bloody end. Shot in a moody black and white with a sense of unreality that makes it very real, this is a fetishistic mediation on life, death and honor that effects the viewer in an extremely visceral way. (I will leave the viewer to get what he can from its sound and images). Its a kick in the gut even before we get to the suicides as we are forced to think about honor and what it means to alive. 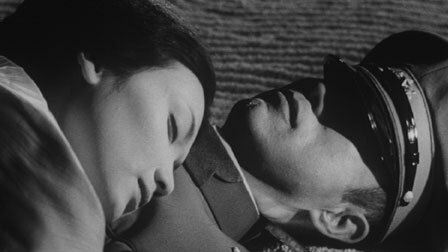 The suicide, though filmed silent (the soundtrack is a scratchy record of European classical music)is so intense that one can almost hear the scream from Mishima's lips when he drives the blade into himself. I won't say anymore other than its drawn out and graphic in a way I've never seen before. (clearly there is a reason why those committing Seppuku are helped along by a friend who beheads them.) I was left shaken by the experience. I can not imagine how audiences in 1966 when this was made reacted when they saw it for the first time. I knew what was going to happen and it still unnerved me. I know I will be contemplating it for days to come. I don't know what to say. It is a masterpiece that is weirdly overshadowed by its creators death and life. It is a haunting experience for those with a strong will.